Orientation Webinar Dates in April and May! Apply now for B.Sc. Mechanical Engineering (International)! Study at one of the leading technical universities worldwide! 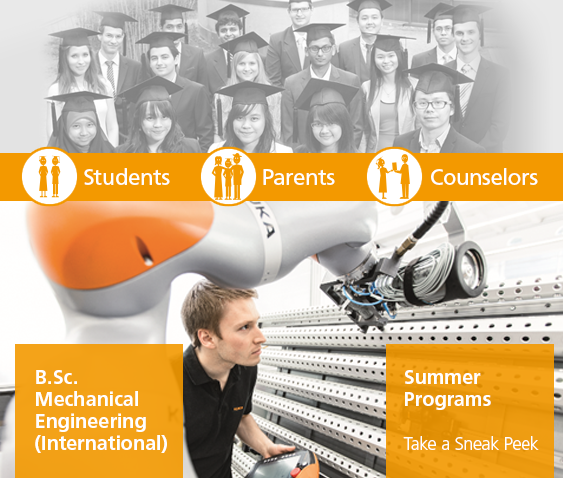 Take a sneak peek: What is mechanical engineering about? Benefit from the strong industry network of CBS! As part of the worldwide renowned Karlsruhe Institute of Technology (KIT), the Carl Benz School offers a high quality undergraduate Bachelor program as well as Summer Schools in Mechanical Engineering in a college like structure. The international programs are English-taught and perfectly prepare students from all over the world for engineering careers. Carl Benz School students furthermore benefit from an individual study and career guidance program as well as an exclusive on-campus housing in one of the safest regions worldwide. Photo bottom: LBR iiwa - KUKA Aktiengesellschaft.